A Six Hundred Twenty Kilometer long human chain was created yesterday in Kerala against the attempt to communalise the environment in the state particularly related to the issues of Sabarimala which the Hindu organisations have been violently protesting against the Supreme Court order of allowing the women to enter into the temple. That even after 71 years of our independence, women, Dalits and others have to struggle and fight to enter into the temples is a shame to say the least. What is more atrocious is the defence of those who justify it in the name of traditions. Women from diverse sections stood up hand in hand and created history, as claimed by many, against the divisive politics of the SanghParivar. 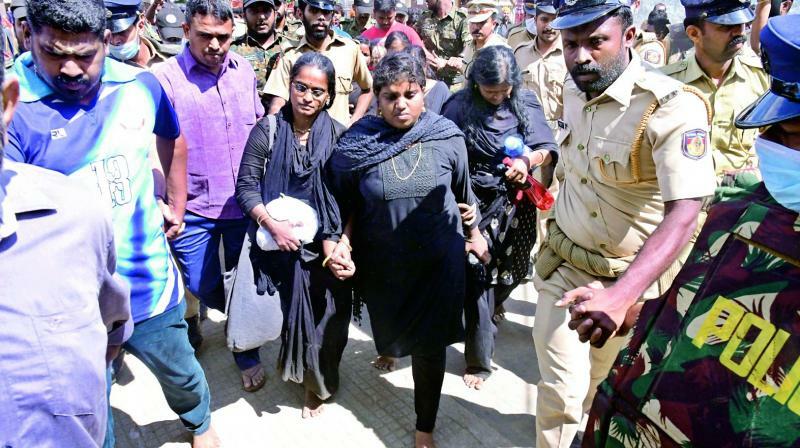 “The sanctum sanctorum of the Sabarimala temple was closed on Wednesday just hours after two women below the age of 50 entered the shrine. It was shut to carry out ‘purification’ rituals. According to reports, the sanctum sanctorum was closed around 10.30am as opposed to 1pm, when it is usually shut. Following an hour-long ‘purification’ ritual, the sanctum sanctorum was reopened just before 11.30am”, the newsminute website reported. This is despicable and yet the priests have no shame. More shame for those who call themselves as ‘political’, talk of gender justice and yet don’t want women to enter there. It also proves a valid point that don’t expect too much ‘revolution’ from political parties. Social movements have to continue to put pressure for social changes as Periyar influenced Tamil socio-political life by deeply analyzing and exposing the wrongs of the Brahmanical system and at the same point of time giving a decent humanist alternative to the people. Now, Kerala government is saying that the priests of Sabarimala temple Priests have committed contempt of the court while the Congress Party as well as the Bhartiya Janata Party has called for a state wide protest against the entry of two women. The state is now clearly divided between two political groups now with Congress and BJP defending the tradition while the left front taking the lead of ‘progressive’ people. Prime Minister NarendraModi yesterday told an interviewer that Sabarimala issue is that of traditions. He went on to suggest that there are many temples where men are not allowed and we must respect that. Definitely, he forgot to mention that a huge number of temples do not allow Dalits to enter inside them but then there were movements against them. Temple entry movements in India have been a source of events for moblisation and building a political movement. Despite all these temple entry movements, the country has not moved much in terms of respect for women and those discriminated on the caste identity basis. Swami Agnivesh fought for the rights of the Dalits into Rajasthan’s famous Nathdwara temple in 1988 and got international acclamation for the same yet even today Dalits entry into those temples is resisted. We had seen many other temples where the entry of Dalits is absolutely prohibited. Many stories have already emerged on Indian TV but we no such campaign as we found in Kerala. Last year women activists fought for the women’s rights of worship in Haji Ali Dargah in Mumbai and it was ultimately successful but this is a fact that most of these Dargahs don’t allow women inside their sanctum-sanctorum. Immediately after the Tsunami, I had travelled to Pondicherry, Tamilnadu and Kerala and at one of the most revered Sufi shrines in Nagaur near Nagpattinam in Tamilnadu, I found that women were not allowed inside the sanctum sanctorum and when the Muttawalior priest allowed me inside the Dargah during the prayers, he proudly informed me how ‘secular’ the Dargah was as it has symbols of all the religious inside it. Suddenly, when he was giving the ‘prasadam’, I asked why are women not allowed then he responded that they are ‘dirty’ because of the menses. This was a shocking answer for me but then this is a common thread among all the major religious of the world where women have been denied equality. Temple entry movement never helped the Dalits. They can never challenge the brahmanical patriarchy because these women actually ultimately wants to be the part of brahmanical patriarchy. If the women have to fight against patriarchy or brahmanical patriarchy in particular, then, the only option for them is to revolt against all forms of brahmanical traditions. It won’t be possible as religion or caste is much bigger identity than gender. Most of the women feel much comfortable in sitting and chatting with their caste fellows than the woman from another community. Ofcourse, they may say or take up some issues but at the end of the day religion and castes are bigger identities and uniting factors for all in our parts of the world. The real challenge to Brahmanism came from two big movements for temple entry and both the movement gave big lessons to two biggest revolutionaries of India. The first one was the Satyagrah launched by Baba Saheb Ambedkar and Dada Saheb Gaikwad for the entry of Dalits in the famous Kalaram temple of Nasik on March 2nd, 1930. The movement was resisted by the savarnas and stones were thrones at the Satyagrahis. Baba Saheb Ambedkar was not the one who would have loved to enter temple to make people more religious but he was more interested to organize the vast untouchable communities under one umbrella, who he called Protestant Hindus but the way the Brahmins and other Hindus opposed their entry into the temple, Baba Saheb was forced to say that though I was born as a Hindu, I would not die as a Hindu. This was a big call and decision of his life which changed everything, and defined the Dalit movement in India. We all know the historical wrong of the Travancore State against the Dalit Bahujan people. The Dalit women were never allowed to cover their breasts. There were many roads where the Dalits were not allowed to walk. Temples were closed for them. Congress launched a movement against it but it never succeeded though it made Gandhi and Gandhian heroes but ultimately neither caste disappeared nor the entry of Dalits became possible. Periyar saw the hypocrisy of the Congress party leaders and resigned from the party. This actually resulted in his launching massive movement against Brahmanism and later forming his own Justice Party. Both Baba SahebAmbedkar and ThanthiPeriyar fought against brahmanical patriarchy and punctured their arguments by exposing them completely. They provided an alternative to people too. Why should people go and enter into temples which deny them entry when we know that these temples are den of casteism, corruption, and ignorance. Baba Saheb might have said these words about our villages and the prevailing caste system there but it can also be said truly about our temples. Today is the 188th birth anniversary of legendary Savitri Bai Phule, a Bahujan woman who dedicated her life for the betterment of women from all the communities. She gave them education, opened schools for the widows and talked about rights of them. The big heritage of Bahujan movement right from Jyoti Ba Phule, Savitri Bai Phule to Baba Saheb Ambedkar and Thanthi Periyar, all talked about leaving the brahmanical slavery and embracing a new way of life which was more humane. They all spoke against superstitions, priesthood and caste supremacy of the brahmins. When I see the huge wall of women which is being claimed as a ‘revolutionary’ step, I wonder how many of these woman would join hand when a Chitralekha is boycotted, a Kausalya remain unattended when her husband who happened to be a Dalit is killed in the broad-day light in Coimbatore, and does not find friends to support her, or an issue of Sanjali who was burnt by the goons while returning to her school. Issue is not here whether it is Kearla or Uttar Pradesh though they are contrast in many ways and none want to compare the two states and the level of understanding and unity of people. While we appreciate the women rejecting the SanghParivar’s attempt to control and dictate terms and conditions to Sabarimala issue and they are very much under their right to fight and reform their religion, the fact is, religions are man-made and unchangeable. The second danger is the attempt to portray ‘unity’ of all despite the fact the socially we are an absolutely divided society whether it is Kerala, Tamilnadu or Uttar Pradesh, Bihar where caste plays important role in our identification or association with groups and movements. Feminists are overjoyed about but Sabarimala is not defeat of Brahmanism but establishing it further. It is suggesting that women can’t live without religion. When one fifty years back Periyar, Ambedkar, Phule and even Bhagat Singh suggested that brahmanical value system in India is nothing but absolute denial of human rights for Dalits, shudras as well as women, where was the need to justify the temple entry? We have seen how temple entry become an event and after sometimes things come back to ‘normal’. As I said, I defend Hindu women’s right to enter the sanctum-sanctorum of the temple but definitely it is not revolutionary as being projected. The revolutionary thing would have been to ask women that there is No God and even if he is inside the temples, he remains powerless, it is people who play power politics with these Gods. Gods and their chamchas have harmed the world, the most. It is time to call them bluff. Investing huge amount of money to ‘protect’ these temples or other religious places and wasting our energy on these issues is a well laid trapped by the dominant elite to keep the people subjugated and deny them to think about them. A big human chain for temple entry is no revolution. I would love to see Kerala and Tamilnadu, two enlightened states to make a big human chain against caste discrimination and untouchability. Let the people speak up against all forms of discrimination and pledge to dismantle hierarchical caste structures and that is only possible once we challenge the concept of God who are created by different religious elites to subjugate people. If Periyar could throw the open challenge in the 20th century and When Ambedkar burnt Manu smiriti or said that he wont die as a Hindu or Galileo could do it in the Christendom or some others in the Islamic world, why is it happening that the people who do not follow religion, are pushing their entry to these temples. It is time for us to keep the religion inside the personal domain of the people. If religion and its value system take our precious time in discussion and orientation, I am sure, we would not have anything else to do except to engage daily on the idiocies created by them. Religions world over never gave any freedom to women. In fact, most of them punished women and made them second graded citizens and I am saying it for all the religion. Religions segregated people and here time has come in the 21st century to make these religions redundant and embrace enlightenment. Religious values will chain you in slavery of mind and breaking away from it will give you freedom to enjoy the modern values of life. If you feel that women are ‘dirty’ because they menstruate then religious values are for you. If you believe that all human being are equal and have minds of their own and can decide things about them then religion is not for you. It is upto you to decide whether you want to choose slavery or enlightenment, the choice is yours. The article says: “Religions world over never gave any freedom to women.” Is the claim factual? Is it factual to make such an absolute claim? Islam has given certain rights to women, which are absent in some other religions. Similarly, some other religions has given certain rights to women, which are absent in some other religions. Moreover, there are some religions, which has given superior position to women. Some of us are not well-acquainted with all religions. It’s neither to defend one religion nor to condemn another. It’s to oppose claims not based on facts, to oppose claims not factual, it’s to oppose the practice that hurts people’s feelings. The article says: “here time has come in the 21st century to make these religions redundant and embrace enlightenment.” Is the suggestion logical? Billions of people have faith on different religions. Do you like to wage war against religions? Please, look at roots, and the spread. Is the war the article likes to wage, or whatever effort it likes to begin to make religions redundant as it has claimed, logical? Has the article thought over the questions: What’s the source of belief? Why billions of people resort to belief? Why they keep trust on beliefs? Answers to the questions will help the article to think second time before suggesting such anarchic path. The article says: “Religious values will chain you in slavery of mind”. Is it factual? Are not there people within religious systems who stood above slavery of mind? And, are not there people in religious systems who fought against slavery of mind? And, are not there people beyond religious systems who enslaved them with backward, reactionary ideas? Cases of both types fill history in different lands, within different religious systems. The article says: “breaking away from it will give you freedom to enjoy the modern values of life.” Is it always correct? Are not there people suffering with pain and having no peace of mind while they broke away from respective religious system? Opposing certain practices is one approach while waging war against all religions is another approach. Please, look at the approach of Albania. At the end, what came out from there? Revolutionaries there in Albania were far more revolutionary, far more authentic, far more sincere and serious than many revolutionaries, many in this group are simply word-mongers, in many lands. What does the experience tell? Shouldn’t one learn from experience, learn from errors and mistakes? Has the article noticed return of church, and its role in social and political life in Russia? And, the role is not limited within social and political life only. Has the article noticed its economic and financial power? Please, think over the issues, and then suggest something. Please, look at the source of ideas: From where ideas come? It’s an old question answer to which human history is looking for. The article should put head there. 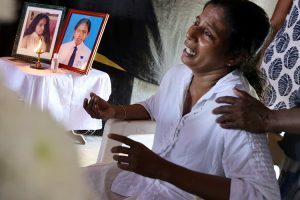 Waging such a war against religious systems will put many against the article, derail people’s fight against injustices and exploitation. Such an approach will harm people’s cause. Anyone has liberty to raise any slogan or suggest any approach. But, all should talk in a responsible way while suggesting something related to people’s life. Please, keep in mind the entire perspective, people’s entire interest. Other major questions related to the issue are not discussed here in this comment section. The article suggests correctly that we, the people, the millions/the billions of exploited, have a lot of issues to discuss, and a lot of areas to intervene. How far have discussions/debates been organized on issues like imperialism, exploitation, tactics exploiters employ to exploit billions of people, level/extent of deprivation of billions of people, dirty spending/consumption pattern of the exploiters, exploiters’ cruelty coated with sweet words, exploiters’ concepts dominating people’s brains, exploiters’ unity cutting lines of creed, caste and color, reasons for resorting to blind/illogical trusts while life increasingly are depending on products of science, tact exploiters use to mobilize millions and millions of the exploited under banner of exploiters’ politics/political party? There are many such burning issues related to life of the exploited, related to the question of emancipation of the exploited. So, thanks to Mr.Vidya Bhushan Rawat for making such a nice suggestion although in the next paragraph he has moved to another direction. His anger, discontent and pain are understood. But, shouldn’t logic dominate anger? Otherwise, his case will be lost. Farooque Saheb, I dont hate religion. I did not grow the non believers and I can bet you, the politics today particularly in our parts of the world, India, Pakistan, Bangladesh, Sri lanaka, Mayanmar, Nepal is controlled by religious elite. There may be difference of degrees. Violence in the name of very high. We still have personal laws which violate basic freedom human being. You may be a good soul personally who define religions in particular way. I know, I have friends who are religious and perfectly defend their rights to define religion in a better way. That way, the campaign by Hindu woman is OK but it is not revolutionary at all. At the same point of time, I must say, we will never have a similar response to issues of violence on fellow women or other forms of discrimination. I am not here to campaign against religions as that would be futile but I am sure you will understand that such discussions give way to new thoughts where people question. I am also saying that religions must be private affairs of individuals and not be used to organise people against other faiths or political thoughts which is happening at the moment. Thank you for your detailed thoughts. Please continue to engage. I do not sit on the computer all the time as I do travel a lot and work with communities hence some time the responses are missed. I apologise for the same but I respect every discussion and dialogue if it is with a thought to engage and betterment of society and not to bully. Thank you again and keep writing. Thanks for making response to my comment. I respect your democratic attitude. I understand, on the basis of your articles, you don’t hate religion. Your writings say that you have full respect to religion, and you don’t like to hurt anybody. I disagree with your following observation: “the politics today particularly in our parts of the world, India, Pakistan, Bangladesh, Sri Lanaka, Myanmar, Nepal is controlled by religious elite.” Mainstream politics is controlled by dominating capital, not the elites you have mentioned. I also disagree with your following claim: “That way, the campaign by Hindu woman is OK but it is not revolutionary at all.” It’s revolutionary, no doubt. Please, look at their courage, the challenge they have created, the demand they have raised, the defiance they have shown, the concept on which they have made their stand, and the implication, immediate and long-term. I’m hopeful that you can fully understand the actions and reactions going on in the areas of their and of many others ideas, attitude. Should their effort be belittles? Your position tells that you are not belittling them, their effort, their struggle. Belittling their struggle will be painful and bad. And, should the claim be made absolute as you write “at all”? Revolution doesn’t occur over a day or days. Revolution doesn’t occur only in physical terms. Revolution doesn’t occur by a single act. Trillions and trillions of acts of courage, conscience and sacrifice over a long period are required for a revolution; and this fact — trillions and trillions — doesn’t cancel any single act of conscience and courage. And, there was/were not only Hindoo woman/women. And, first of all, they are/were human; then, they are/were women. The campaigners have freed many persons like me from burden and shame of inaction. The campaigners have carried forward the spirit of humanity, justice and rationality and logical way of analysis. They have freed many persons like me from sense of shame. The campaigners have not only acted in physical terms. They have acted and impacted in the area of ideas. Their acts were not only limited to a single area/party hostile to the cause of humanity and rationality. The acts also targeted the people friendly to them. How? They have taught many ordinary, useless persons like me. Their acts will continue impacting. ; continue impacting on a wide area, continue impacting in many areas including concept, definition, legality, authority, power and basis of authority, ideas and ways to challenge authority. I hope, you’ll reconsider your observation made in the sentence I have quoted. Your efforts and labor are great. I have full respect to your efforts and labor. It’s encouraging that, as you write, you do not sit with computer all the time as you are to travel a lot and work with communities. It’s great that you travel a lot and work with communities. Great workers work in this way. Work with communities is a real work. And, sitting with computer all the time is not possible for anyone unless he is not engaged to do that way. That’s the reason, I must say, you are setting example. No reason to apologize by you for missing response as, I understand, your work and time don’t always permit you to make response. However, your latest response tells you don’t ignore comments, a democratic practice. I don’t ignore your practice. Rather, I praise your practice.